What is one thing that people of all nations, colors, and creeds have in common? We all eat. Food unites us and a worldly traveller takes advantage of every bite to soak up all that a culture has to offer. From street food prepared for the masses and sold in stalls, to home-cooked family recipes perfected after generations of fine-tuning, to elaborate banquet meals put together by many to celebrate a momentous event- food is the pulse of a culture. Food fortifies, it brings people together, and is celebrated, and cherished. Eating like a local is an important aspect in getting an accurate look at a culture. I don't mean learning to say Big Mac in languages around the world or stopping at establishments that cater towards tourists, advertising full English breakfasts in far-flung Asian cities. I’m talking about immersing yourself in a place and a way of life and eating what and how the locals eat. In Argentina people don’t eat dinner until 10pm at the earliest, in Thailand people don’t use chopsticks unless eating noodles, in France if you order your meat rare you will literally eat a piece of cow that has been told to briefly run through fire. These are good things to know. I’m also talking about trying new things in a foreign place. Leave your comfort zone and experience a different way of life… that’s what travelling is about isn’t it? If locals are eating skewered chicken hearts in Rio de Janeiro, try them. Jump at the chance to try kangaroo steak in Australia. Even though you don’t read Japanese, blindly order sushi in Tokyo anyway. What’s more than eating like a local is understanding the ingredients and care that goes in to the preparation of the local cuisine. During my travels, I’ve found that cooking abroad is the best souvenir you can buy for yourself. Learning to cook overseas allows you to bring a piece of the country and the culture home with you to enjoy with family and friends for the rest of your life. There are cooking classes all around the world. They are usually given in English and are open to everyone- tourists and locals. 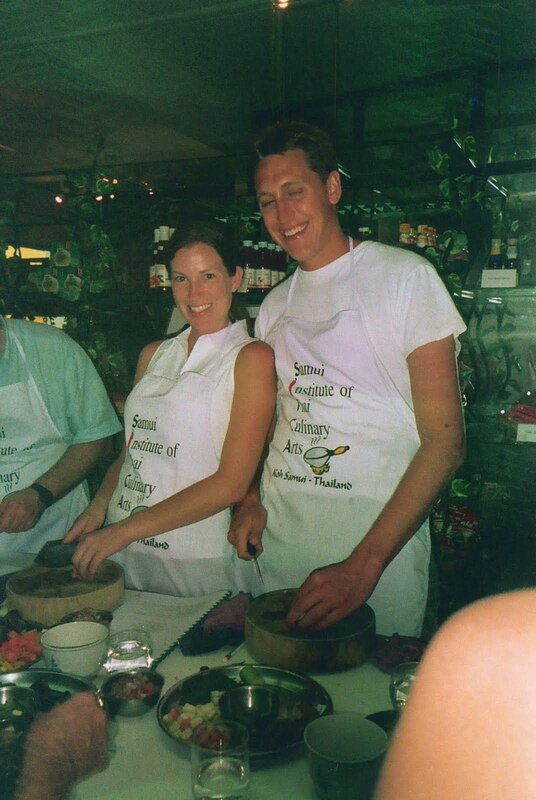 In addition to cooking instruction, the class is time spent in a personal setting with locals, as well as people from other parts of the world. Cooking classes abroad provide great perspective into other people’s lives and better insight into their cultures, through informal conversation over food and wine. I’ve participated in several cooking classes all over the world and have had a different but equally delicious experience each time. A few components were central to each class; instruction by a chef native to the country, class participation in preparing the food, and a feast shared with fellow students at the end. I love to cook and I love to travel and in my opinion, the combination is a match made in heaven. Roberto, the cassero (ranch hand) at the breathtaking Estancia Tierra Santa in Carmelo, Uruguay gets an assortment of meat out of the refrigerator. With the help of Karen Vandergrift’s translation, the beautiful and gracious owner of Tierra Santa, Roberto gives my husband and me some information about the Uruguayan asado (traditional technique for cooking meats) in the estancia’s big, intricately tiled kitchen. Asado is the national dish of Uruguay and is cooked on a special grill called a parilla. A parilla is a specially designed grill, usually constructed out of bricks. There are two sections in the parilla, one where the coals or wood are heated, and another section that contains the metal grill, also called la parilla. On one side of the parilla the wood or charcoal is lit on fire, creating hot coals. The coals are delivered to the other side of the parilla, underneath the metal grill, with a metal shovel or metal tongs. The asador keeps track of the progress of each cut of meat, delivering coals and moving them around appropriately. The key to a delicious asado is cooking the meats ‘a fuego lento’, or on a slow fire. If the fire is too hot, the meat burns outside, and remains raw inside. Outside, next to the parilla, I watch as Roberto puts on some chorizo (pork sausage), lomo (beef filet), tira de asado (the typical Uruguayan asado meat, a cut of beef from the ribs area), chicken, and lamb fresh from the estancia. Roberto, an asado maestro, expertly tends the coals of the parilla and cooks each piece of meat to perfection. People don’t eat dinner in Uruguay until late at night. It’s nearly 10pm and as the summer sun begins to set, fireflies light up the darkening countryside panorama. The sound of the stream that runs behind the estancia is in concert with the crackling sound of the glowing embers of the parilla. I have a sip of my wine, a beautiful tannat (Uruguay’s national wine- red, soft tannins with blackberry notes) from the Irutia winery, a neighbor of the estancia, and watch Roberto skillfully tend the grill as he regales us with talk of his life as a ranch hand. ‘A good trick to see if the oil is ready for frying is to put a wooden spoon in it and if it releases bubbles immediately, the oil is ready’, instructs Teresita, the owner of Cooking with Teresita just outside Buenos Aires, Argentina. Inside her spacious kitchen located in her own home in the town of Adrogue, she plops a batch of empanadas into sizzling oil. The hissing sound of the dough in the oil makes my mouth water for the traditional stuffed pastries. The cooking time for empanadas in quite short compared to the time spent preparing them. Our class of eight students make two types of empanadas, one with beef filling and the other with humita (sweet corn) filling. Each student is given a particular job to participate in the empanada preparation. Some people chop bell peppers, some pit olives, some chop onions and hard-boiled eggs, others cook the meat and corn. Teresita wanders her homey kitchen giving helpful hints and attentive instruction along the way. Once both the beef filling and humita filling are cooked, Teresita and her eight hungry pupils, including myself, begin to work the dough. We mix flour, pork butter (lard), and salt water to make a light and crispy pastry dough to enclose the savory fillings. Each student rolls many balls of the dough and then flattens them out to be filled and either fried or baked. While preparing the empanadas, Teresita passes wine glasses out to each student. She fills them with an Argentinean Malbec from the Mendoza region. It is deep red, robust, and will go well with the beef empanadas. When the Malbec has been imbibed Teresita pours a Torrontes, a distinctive white wine only produced in Argentina. It is dry, floral and fruity, and will go excellently with the humita empanadas. After our lesson on Argentinean wine the empanadas are ready to cook. Teresita ushers us out to her lushly planted patio to enjoy more wine while she completes the cooking by frying and baking the empanadas. At the Samui Institute of Thai Culinary Arts (SITCA) in Koh Samui, Thailand each student is given their own cook station with a stove top and cooking utensils. All of the cook stations are side by side and encircle an expert Thai cooking instructor. Each student follows the instructor and actually prepares his or her entire meal by themselves. We start by following the instructor who with a strong Thai accent explains and demonstrates the way to deep fry red-hot chili peppers in oil. We then put cumin seeds, anise, cardamom, clove, cinnamon stick, and black pepper in a dry pan and sauté until fragrant. Each student follows along with excited trepidation, as most of us are novice Thai chefs. Each of us put the toasted spices into a mortar and grind with a pestle into a fine powder, and then add the fried chilies to make a fine paste. The aroma of the spicy chilies enters my nose and makes me sneeze. We finish preparing the curry powder by adding plenty of citrusy lemongrass, and earthy galangal, as well as shallots, and garlic and then grind until smooth. We continue following our instructor as she begins the preparation for Massaman Curry with chicken and potatoes, a spicy Thai dish of Muslim origin. I cut a chicken breast into 1x1 inch squares and mix it with curry paste and chicken stock in a large wok. The chicken crackles in soy bean oil and a splatter hits my arm, ‘ouch!’ I say aloud. I brush off my minor injury and continue on by adding potato, onion, peanut, coconut cream, tamarind juice, fish sauce, and palm sugar to the wok and mix well. The aromatic combination cooks in the wok for several minutes and fills the large, professional kitchen with a wafting aroma of spicy goodness. The art of fruit and vegetable carving is popular and celebrated in Thailand. We are given a short lesson on how to carve a carrot into a flower to adorn our plates. Most of the students manage to carve wavy circular shapes but my ‘flower’ looks like a cone with a hole in the middle of it. Definitely not what I was going for in my initial design! I bite into the tender flavor-bursting Imam Bayildi, an eggplant braised in olive oil with onion and tomato, as savory olive oil drips down my chin. This Turkish dish is literally translated as ‘the imam (holyman) fainted with joy’, which apparently happened to a Turkish imam as he swooned with pleasure at the flavor of the succulent dish. I am a bit light-headed myself as I devour the dish that I had the privilege of preparing with the instruction of Chef Feyzi at Cooking Alaturka in Sultanahmet, the historic heart of Istanbul. After all of the preparation and cooking, there’s nothing quite like enjoying the fruits of your labour with your instructor and fellow students. The relaxed casual atmosphere is really the best time to learn about a country and people that you can’t read in a guidebook or a cookbook. On the rooftop of Cooking Alaturka, owned by Eveline Zoutendijk, we learn about her beginnings in Holland and her culinary travels that took her to Paris where she received a Grand Diplome from the elite Cordon Bleu cooking school. Though French trained, she delights us with stories on her love for Turkey and Turkish culture. It is fascinating to hear cultural impressions of a foreign country from an expatriate. We then learn of Chef Feyzi’s origins in south-eastern Turkey, the notable spice region, and how spice and regional flavours play into his everyday cooking. We also get to know our fellow students from all over the world and hear about their experiences in Turkey as well as what their lives are like back home, wherever home may be. Whether the discussion is on books or films, travelling, politics, food, differences between countries and cultures, language lessons or jokes (all conversations we’ve had with cooking class instructors and fellow students from abroad)- there is always something to be learned from other people, especially people from another place. Learning about how other people live and think opens up your eyes to the surprising and amazing world we live in. If you like to eat and you like to cook, try a cooking class on your next trip abroad. Culinary tourism is a burgeoning sector of the tourism industry and there are many cooking classes taught in English all over the world. Cuisine is a manifestation of culture and to understand it and fully experience it, you will gain deeper insight during your travels. By participating in a cooking class abroad you’ll surely learn more about food, yourself, and the world than you ever thought possible in a mere few hours. Bon Appétit!